We're creating a global community to make the world of K12 education innovation truly international. What is our approach to building the HundrED Community? Many individuals across the world are deeply passionate about improving education, expressing a multitude of reasons specifying its importance. Yet, due to the disconnect of insights and information in education, they are too often unaware of other stakeholder perspectives and innovations that are working impactfully, committed to scale and addressing key needs. Educational stakeholders are often unable to take into account global perspectives and insights in education, hitting language or financial barriers that prevent them from tapping into global knowledge bases and exploring practical examples: to understand, seek, implement and reflect for improvement locally. Understandably, many initially believe that innovations and changes being made in different countries could not and do not apply to their situation, yet it appears that across the world common issues and goals do arise. This does not mean there is necessarily a cut and paste solution for education, but there is an opportunity to bridge understanding and work together to make adaptations that fit within each individual context. If we are not making this knowledge base and community accessible, and celebrating their tremendous value, we are ultimately hindering opportunities for the world’s children. This is where we step in. HundrED was born from the notion that in a world becoming increasingly connected and globalized, education can still be very local and isolated in its practices. Our goal is to support improvement in education and inspire a movement, opening up valuable innovations to spread across the world mindful of context. HundrED focuses on celebrating, inspiring and empowering all stakeholders to create positive change in education, we strive to keep the conversation open. Everyone’s voice is welcome as we realize that no singular point of view can change education for the better. 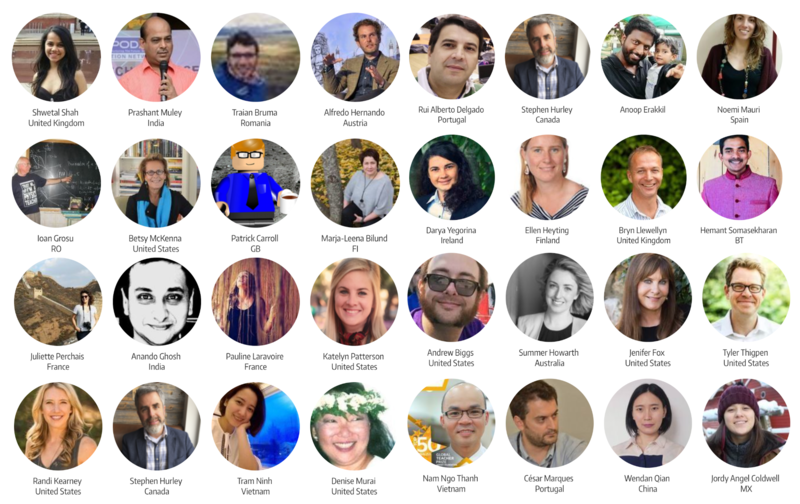 HundrED’s Community comprises of our innovators (Finland, HundrED 2018, HundrED 2019), educators, policymakers, parents and other influential stakeholders. We are passionate about improving education through collectively discovering, creating and sharing inspiring innovations in K12 education. We further have a booming community of Academy members as well as Ambassadors, who provide invaluable support in selecting innovations and growing our outreach. Many community members initiate communication & partnership projects with each other. From our end, we engage and connect members of our community through newsletters, online discussion groups, webinars, personal support via email and video calls, and face-to-face meetups and events. HundrED is working tirelessly to represent a Global Community. We are ambitious in our aims, but we truly believe that without representatives spanning all countries, ethnicities, genders, sexualities, ages and abilities; we would not be honestly portraying the education community globally. For this reason, we encourage everyone to apply to be a HundrED Ambassador and utilize this opportunity to join a truly diverse education community. While being open and flexible to co-create this with our Ambassadors and other community members, the goal for the HundrED Community is to spread the message of positive examples of innovations in education globally. We dream to have local events, meetups, innovation campaigns, policy discussions and more being led by our community while our supporters continue to write and promote us and our innovations in their local media. How do we connect, support and celebrate our community? Our community members have various platforms through which they connect and get together. Come join us to stay up-to-date with what is happening at HundrED and with our innovators and other education enthusiasts from around the world!